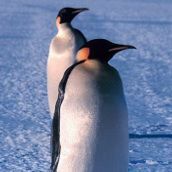 GigaDB Dataset - DOI 10.5524/100005 - Genomic data from the Emperor penguin (Aptenodytes forsteri). Genomic data from the Emperor penguin (Aptenodytes forsteri). The Emperor penguin (Aptenodytes forsteri) is a large penguin, standing over 1 meter tall, with distinctive black, yellow and white markings. Like most penguins, the emperor penguins are indigenous to Antarctica and exist between the 66th and 78th parallels. Famous for its unique social and reproductive behavior, the emperor penguin also possesses a number of other notable evolutionary qualities: its stature, its feathers, its incubation process, and its swimming capabilities. The Aptenodytes forsteri genome offers new insights into this remarkable bird.